The seed for L’Eroica started 18 months ago when I wandered into BikeBug Nth Sydney, to admire the vintage bicycles hanging on the wall. The salesperson had completed L’Eroica and described how it involved sourcing a vintage cycles and how tough, yet enjoyable the whole ride was. 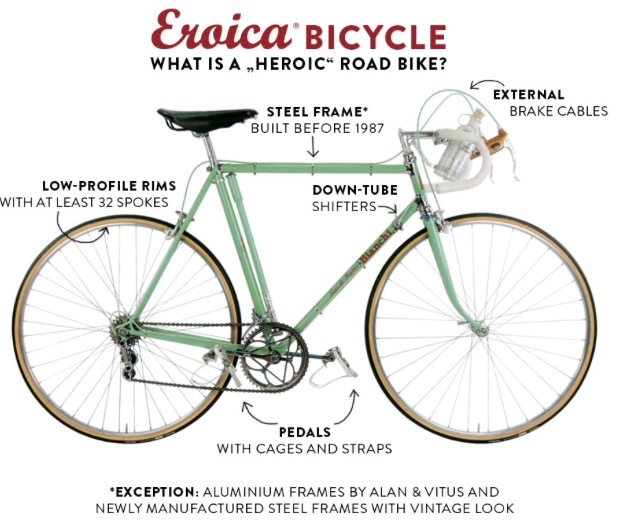 A L’Eroica bicycle should be steel (exceptions being 80’s Vitus or Alans aluminum), have toe clip pedals, down tube non-indexed gears and exposed cable non-quick release brakes. Components should be consistent to age- ie 50s brakes on a 50’s frame. The L’Eroica Gaiole routes have options of length- 85km, 135km and 209km. There are many dirt sections, each 3-10km long which are about 20-25% of the total length. The roads are called “white roads” and are white gravel from the region. They are hard to ride up due to steepness and loss of traction and harder to descend due to corrugations, soft edges and ruts. Whilst initially looking for a bike, I found an 80’s Vitus 979 for sale within walking distance. With hindsight, I probably paid too much and after some riding and adjustments it was still a bit too small. Eventually, I found a great Vitus 979 in the correct sizing and it had a bonus new Brooks leather seat, extra wheels and at a good price. It was a light bronze tube colour and had been brought from Ireland by the original migrating owner, with the second owner being gifted and never riding it. So I was the 3rd owner of a 30+ yr old bicycle and its history seemed sound. I had been a previous Vitus 979 owner, having purchased one new in the mid 80s. For a car-less year it was my only transport, and also used in my obsessive triathlons years (1985-88) , and club racing period. Unfortunately, it was stolen from my garage after seven years of ownership. It was a great bike, which suited my light build. Eroica Vitus 979 #2 - Size 54 and a good fit. Meanwhile, I had done a preservative/restoration on my brother’s 1969 ‘Healing’ school bicycle for his 60th birthday. I learnt about the Australian “A.G. 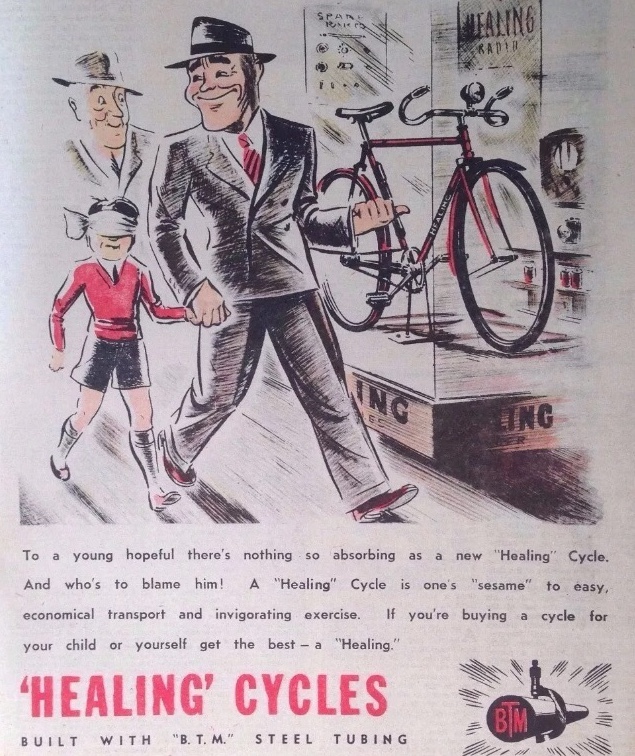 Healing” brand and also sourcing vintage bicycle parts. The extinction of the brand occurred in the 1970s, the result of the post WW2 boom making cars more affordable and bicycle commuting fell out of favour with Australians. The influx of Japanese frames of late 70s, wiped out mass frame manufacturing in this country. After buying a worse-for-wear Healing frame, I set about welding the broken brake bridge, sanding off the house paint and respraying to my desired vintage paint scheme. From the frame weight and age, it appears this frame was the constructed of Australian made Reynolds 531. 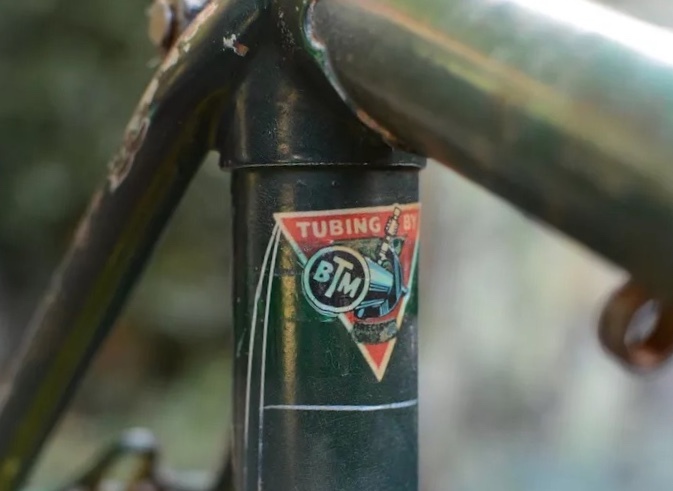 A factory called “BTM” was set up in Sth Australia, as a joint venture between Stewart & Lloyds and British Reynolds company to supply tube for the bicycle industry. The BTM Decal are rarely seen. My Healing decals were sourced from Cyclomondo in Coffs Harbour. These are excellent quality and a great addition to a vintage bicycle. For gearing, I decided to use a Sturmey Archer internal geared planetary hub. I fondly remember my high school bicycle which was handed down from my father. It was 1948 Malvern Star with Sturmey Archer 3 Speed, and it was perfect in my small country town. Once decided on Sturmey Archer, I started looking at availability and pricing of different model. The famous Englishman Tommy Godwin (held the highest annual mileage record for 75yrs from 1939) used both a 3 and 4 Speed SA. 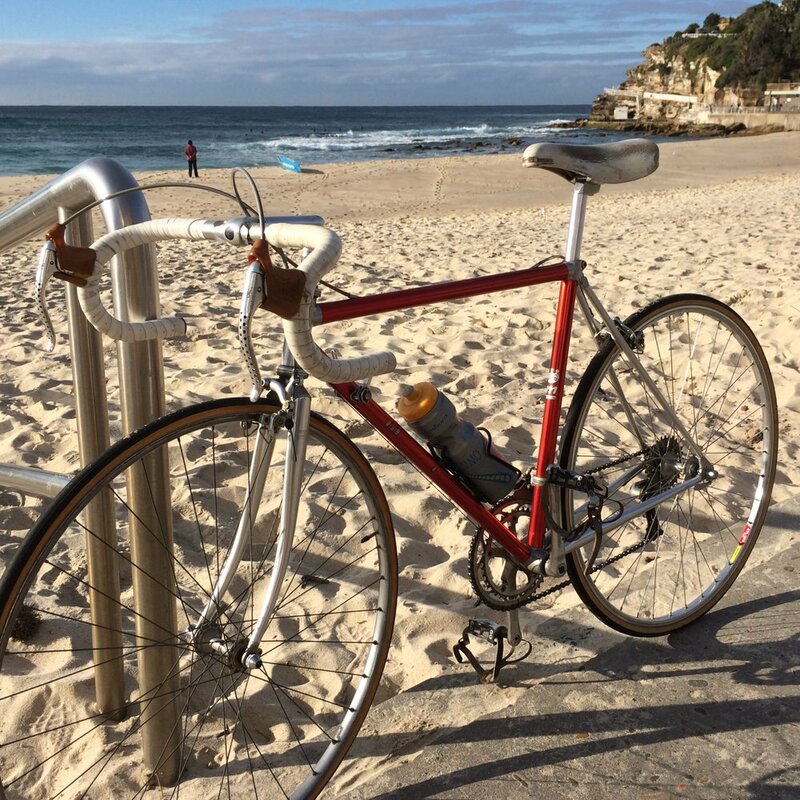 With just a week before L’Eroica, I was seriously considering using my standby Vitus 979, as the S.A. gears were slipping and not capable of riding up my local steepest hills. With a lot of morning test rides, some loss of skin and amalgamating different mechanisms, I got a working Sturmey Archer FW Alloy 4 Speed. As was the British standard till the 70s, the SA rear hub was 40 spokes , so I sourced some NOS rectangular channel anodized rims and laced my first wheel. For instructions I used a 1953 Sturmey Archer wheel building manual from their archive site. When I ran out of time, my front wheel ended up being an early 80s 32 spoke MAVIC MA40 in anodized grey. The brakes were Mafac Racers, popular French brakes from 60s and 70s. These were readily available and mine were NOS. The brake blocks emit a loud squeal, which is better then a bell! The handlebars and stem were French and came with a bundle I shipped from France. The lowest gear (1st) could handle all local hill, but in reality in L’Eroica Gaiole, it was tough on the legs. Riding a SA, the ideal setup is to have your flat road spinning gear to be the ratio for 2nd, and with the 47/22 it felt just right for flats and most hills. My seat was a standard Brooks B17 Standard which was almost brand new- this is the default seat for L’Eroica bicycle. On the underside of the leather, I softened it with Dubbim and it was quite comfortable from first use. Opinions on Brooks saddle are split - some love them, others not quite. 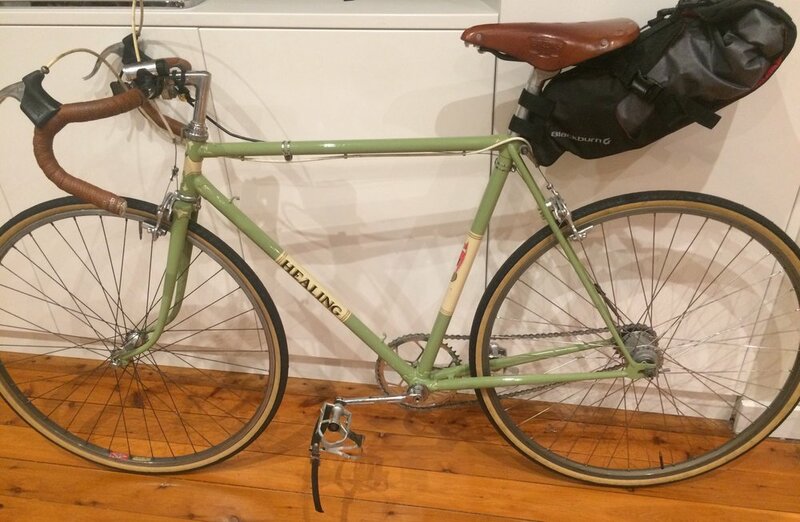 My school bike had a leather seat ( Australian Bell brand) that wasn’t too comfortable as it had a ridge down the centre due to uneven leather stretching- that problem pre-dated my acquisition. Healing Reynolds 531 BTM - Serial #6040; Chromed “H” Badge. 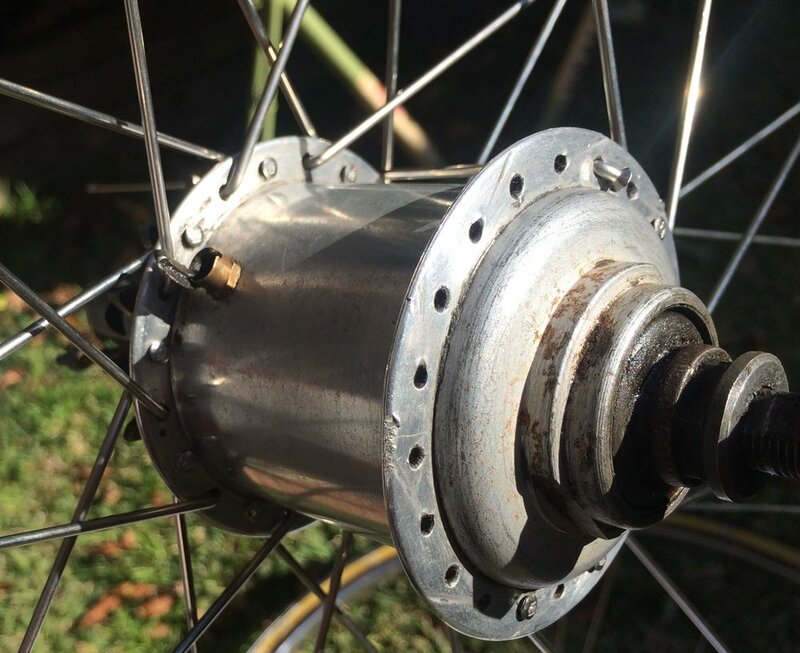 Rear Hub - Sturmey Archer 1953 4-Speed FW Alloy - 40 hole. It was an early start and after a few calls to taxi companies, my ride arrived. There is no Uber in Italy. The trip to Bologna Central was only short and cost €16 in quite time compared to curbside hailing which was €8.50. It was worth it to not lug the bicycle bag 2.5km. The Frecciarossa High speed train was on time for 8:08 departure and arrived in Milan Central about 1 hr later. The top speed I measured with GPS app was 297km/hr. There was only seconds to spare changing to the Malpensa Airport train T2 (which includes T1) as there was a walk between platforms. At the Malpensa airport, I thought I had plenty of time till I joined the immigration queue. From the panic, I’m sure a few planes were delayed or passengers missed their flight. The 10hr flight to Bangkok was very comfortable in the same Airbus A350 as the flight over. I slept well. Transit at Bangkok was also an exercise in queuing and eventually I made the gate for flight to Sydney to arrive at 21:00. So far I’ve watched two Netflix “Broadchurch” and a George Clooney movie. Great service that downloaded Netflix! After connecting to airport WiFi, I communicated with ground control and have arranged a pickup. Looking forward to seeing everyone. So ends the wonderful cycling trip to Italy. Everything went to plan and more. Hope to be back soon. Milan - Bangkok -Sydney 22hrs. Today is my last day in Bologna and I have really enjoyed this old City. Today’s plan was to cycle to the City of Modena, to visit the Enzo Ferrari Museum opened in 2011. The Garmin bicycle took a longer route then expected (48km), so it took about 2:20. On route, I passed the Lamborghini factory at Sant'Agata Bolognese then another 17km to Modena. 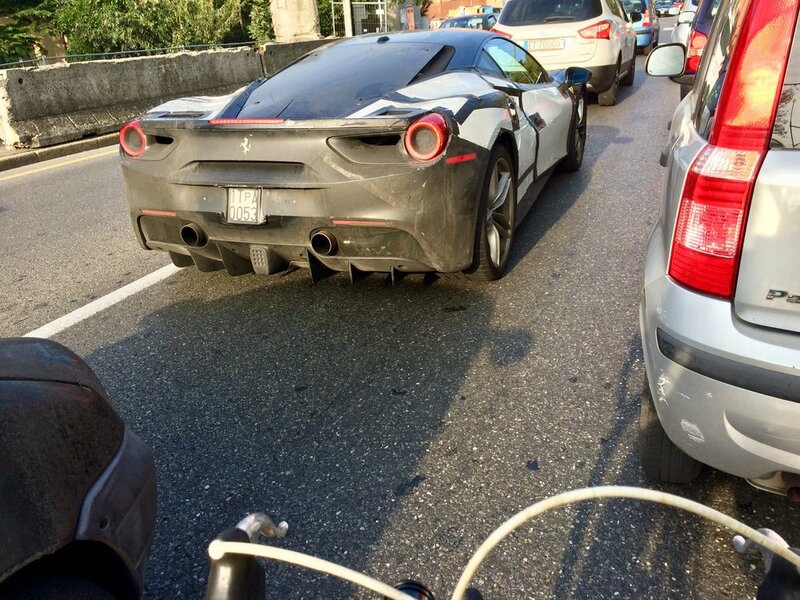 On the cycle out of Bologna, I followed a matt black Ferrari, covered in white camouflage decals. Not sure if it was a new model being tested, but I did cycle fast to get a photo. The Enzo Ferrari Museum is a futuristic yellow dome, build half underground. It is near the railway station for easy access. Part of the museum is the house and early workshop of Alfreda Ferrari and the birth place of legendarily son and engineering innovator Enzo in 1898. In 2007 our family had visited the new Ferrari Museum and I expected a bit more. It didn’t have some of famous Formula 1 cars, and didn’t present the background story easily. I expect it would have been updated and improved as it gets good reviews. In contrast, this museum had examples of most famous road cars and had lots of reading material of famous locals such as the Maserati brothers. There were two excellent films shown on the large dome wall, one on the history and the other on famous owners and pop culture connections. 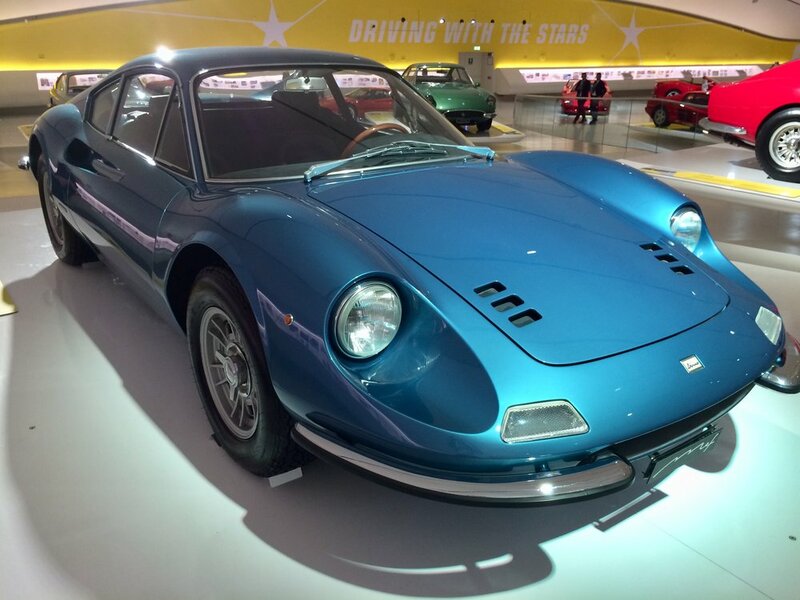 My favorite Ferrari was still the 1970 Dino 246, although it never carried a Ferrari badge. In contrast to the trademark V12 or some later Turbo V8s, the Dino had a small V6. The old workshop had a great engine exhibition and two F1 race cars, one being 2009 F60 F1 car - won Belgium GP driven by Kimi Raikkonen. All up a great museum for anyone with a car interest- €16. Forecast thunderstorms threatened and fortunately didn’t start till I was back. By overruling the GPS (set on bicycle routing), the trip was 8km less. Cycling distance was 99km and about 5hrs. The plan to have an early dinner at 18:30. This was changed when the cafes weren’t open yet, so I headed back to room to pack up my bicycle. Dinner - was at the local cafe “Sotto Sopra” and included complimentary Bruschetta. I enjoyed strip steak in lemon grass for main meal and mascarpone desert for my last night in Italy. It was time for a slow day. After a long breakfast and lazing around writing my blog and researching being a tourist, I headed out late morning into a clear, warm autumn day. I walked via the university district and found more good restaurants. There was a lot of students, bicycles, and scooters. Classes appeared to be in today. Posters remained for Pope Francis’s Bologna parade on last Sunday. Being after midday, most retail was shut for the lunch break, so I found a comfortable spot in a pretty square ( Piazza Santo Stefano ) and started the John Grisham book titled ‘The Broker’, set in Bologna. I visited a simple little church on this square and realized this was the only church I had entered on my entire Italy visit. In later research it was one of seven churches on this site named : Basilica di Santo Stefano . It dates from 5th century. Then I walked back to the tourist office on the main square and bought a 15:30 ticket for an ascent of the 12th century brick tower. The climbed up the 488 wooden stairs to the top at 97m was not too scary. Built between 1109 & 1119, these towers were part of originally 200. Today only 20 remain, including these two (“Duo Torri”). It leans 1.3°, compared to Pisa’s lean of 3.97°. Having passed mandatory cardiologist medical check for L’Eroica Ride, I felt ok on the climb. Tonight I consciously stayed away from the tourist area and found a line of cafes in my residential area, only 400m away. This was one of my best meals so far - Bruschetta (€6) followed by Tortellini (€6) and salad, with bread and Pinot Gris wine. Today’s plan was to cycle 45km to Imola to see the historic racetrack “Autodromo Enzo E Dino Ferrari”. It was good cycling weather and eventually I forced the GPS to take a quieter country road route, on which I passed other road cyclists. In Imola, I purchased some bread and tasty cakes at bakery- “Panificio Darchino”. The racetrack is located to central to town and winds through a beautiful park. I found the Ayrton Senna memorial statue and large number of personal messages and flags. I read on Wikipedia about the crash and enquiry and how the charges against the team continued in the Imola court for years before being dropped. The race was 1994 San Marino Grand Prix and Senna was racing for Williams team having won three titles in 1988, 1990 and 1991.He was under a lot of pressure having not finished the first two races of the season. Tragically, Austrian rookie Roland Ratzenberger was killed in Saturday qualifying. His team mate Rubens Barrichello had suffered a series accident in qualifying. Lost control - he was under a lot of stress. Later in the afternoon there was about 30min session of Ferrari’s going very fast and it was good to watch. The track grandstands looked very old and the run down. The last MOTOGP there was in 1999 when Mick Doohan rule the track on his Honda. The last Formula 1 was 2006. Most Italian car and bike races now are at Misano and Monza. Imola also holds a historic spot in Ducati’s history, when in 1972 Paul Smart and Bruno Spaggiari beat Giacomo Agistoni at “200 Miglia” riding a silver 1972 750. Bike no 16. Fabio Tiagilioni designer. On the cycle back to Bologna, I retraced my scenic rural route and arrived back to Bologna at about 17:09. It had been a long day, covering 100km in just over 5 hrs in the saddle. Dinner was at a very nice restaurant in the tourist area. For a change, I ate pasta, salad and drank Pinot Grigio wine! My plan to cycle the 8km to the Ducati Factory was much easier then expected, as the city is flats, and has lots of heavy utilized cyclepaths. Fortunately, I had taken the Ducati Factory Tour in 2008, as it closed for a short recess. Using my Ducati Owners Card, I purchased a discounted museum pass. The museum had been changed and I was pleasantly surprised to see mention of the Australian riders (Corser, Bayliss and Stoner) who had contributed to their racing success. It was definitely worth the visit and I enjoyed it the second time as much as 2008. The cycle to Lamborghini in the direction of Modena was about 30km and although busy, it was easy riding. I arrived with spare time to visit the museum first. It had some special historic cars, starting with the second prototype of the 1966 Bertone body designed Miura in metallic white. The first was destroyed in fire. Before the factory tour, I met an Aussie couple who were interested in my vintage bicycle and on the same 3:00 tour. Whilst viewing the museum, I talked to the attendant about the Contach on show. This is Contach#1 from 1973- it was originally red then painted green for next motorshow as there was only one car. The Lamborghini assembly plant tour was excellent, exceeding expectations. The museum attendant with whom I had spoken, turned out to be our factory tour guide and was very knowledgeable and passionate. She had previously worked at Ferrari. It is common for Lamborghini customers go to visit the factory to place their order. One the tour we were told of one couple arrived and started out Blue exterior and black interior. After passionate discussion between the couple, the car was ordered Pink/Yellow. The workers can’t wait till it’s build! Japan is the 2nd largest market after USA. Also most Japanese orders are Left hand drive to be different and to increase resale value. Dinner was at a Clavature, a restaurant in the tourist area. I enjoyed pasta and chicken main as I had skipped lunch. Still largely depending on Maps.me, I made it back to accommodation with 4% battery left- lesson to self: always carry a map and learn to use it! Cycling today was 60km round trip. The Bologna cycle paths are excellent and drivers quite respectful of cyclist. Tomorrow, I plan to cycle to Imola town about 40km away. There is practice for the weekend’s Ferrari Challenge Race. There is also a Senna memorial to remember his tragic accident in 1994. Ducati 916 - from 1992 & still a machine of beauty. Day 5 - Mon 2nd Oct, 2017 - Siena to Bologna. The excess of exercise resulted in an excellent sleep and I was ready to pack my bicycle for the train trip via Florence to Bologna for stage 2 of my holiday. Being hungry, I enjoyed extra servings of the excellent breakfast at Hotel Italia. I walked 100m to the escalators and arrived at the Station with plenty of time and more energy then my arrival in Siena. The regional train to Florence took about 90mins and I bid farewell to the rolling Tuscan hills till next time. The Frecciarossa high speed train was an easy platform change at the busy Florence Station. The only difficulty was luggage storage, being a full train. On these trains there is mainly overhead storage and one smallish floor to ceiling racks outside the carriage. Upon arrival at Bologna Central, I opted for a taxi (€9) as the accommodation was 2.5km away. Turned out the accommodation (Ospitalità San Tommaso d'Aquino)was part of the Catholic Church and resembled twin dorm rooms and were quite, clean and in a great location. I eventually headed out and walked to the main square and tourist office. The city had the oldest University in the western world and dates to 1088. The streets are narrow, cobbled or paved, layer pit in a fan pattern from the square. A lot of sidewalks are totally covered with stone arches. Dinner was again tasty with some local tortellini, done in a soup, followed by local meatballs with peas. The setting was an old book shop and the waiter helped me order. I noticed that selecting an empty restaurant just meant I was early as by my second course it was usually busy. My plans for the train travel, taxi and accommodation had fallen into place and I fell asleep early. I left Siena at 4:20am and cycled 28km in the dark to the start at Gaiole. A quote for a taxi one way was €55, which I decided to spend on a nice meal later. As I rode into Gaiole, there was already a stream of lights from riders who had started on 209km ride (from 5:00am onwards). At the start, I put on my suncream (in the dark) and it reminded me of the past insane start times when competing in the Sydney Half-Ironman in 1986,87,88 at Narabeen Lake. After getting the first checkpoint stamp, it was a relaxed start from Gaiole with no idea of what lay ahead. It was a festive mood and no urgency for the early start. About 5km along the road, we turned left and started the long climb to Castello do Broslin, at 10km, 525m & 39mins. This was also the first gravel section of nine, which with fresh legs seemed tame. On the return journey 11hrs later, this section was a lot tougher! The first gravel section lasted 3km, but I soon found descending was a lot harder then ascending. I had researched tyre selection and chose Panaracer Pasala tyres in 28mm width. The 60’s ‘Mafac Racer’ brakes were not great, so I went a lot slower then others. As some descenders found out, it’s a long, painful wait for an ambulance. Research on handling the loose gravel climbs and being fast/safe on descents only help a little in practice. 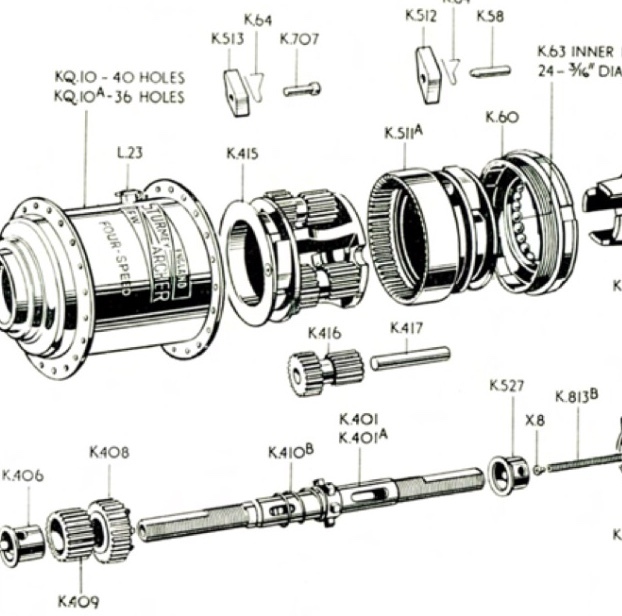 My English Sturmey Archer FW 4 Speed was geared as a compromise between bitumen and dirt- in reality those with derailleur had two extra lower gears then my internal planetary hub and could keep traction by remaining seated and spinners their legs. The 209/135km Route headed south towards Siena, after crossing the river at Pianella. I was familiar with this town as it was halfway on the bitumen between Siena and Gaiole which I’d ridden on the previous two days. Radi was the first food stop at 48 km & 9:35. As with most cyclists, this was the first gravel climb to walk - the village was at 245m. As the ride went on, it was evident on the steep climbs almost everyone walks eventually. Those not practiced and prepared to exit the toe clips quickly had zero speed falls. I lost some elbow skin on the first dirt section when I found an unexpected false neutral gear. From then on, I was prepared and selected and held first gear- it did happen a few times, but I eventually adjusted the stretching cable and had consistency of low gear selection. Another observation was the number of broken derailleurs when the rider realized too late they needed a lower gear. Most climbs were littered with broken bikes and walking riders. It also appeared that many waited for the mobile mechanic on his vintage Vespa to change their flat tyre. I was surprised at the number of riders using glue-on tubular tyres. Having used these in the 80s, I could see the advantage of quick changing and also it was easy to carry two spare, criss-crossed across the chest like the racers of old. A number seemed to have tyre trouble, which fortunately I did not. In the two weeks before leaving, I had a lot of flats on my new tires, all attributed to the incorrect rim tape. At 55km was the Murlo control/stamp point. It was a lovely village and the local clergy were welcoming riders and getting group photos. Missing the cutoff for 209km route by 7mins at 65km was no surprise and almost welcome. Calculating my average speed, I was ok with doing 135km. 65km had taken 4 hrs with stops. So it was still a long way to go. At Buonconvento-67km was the junction with the 209km route, and these riders were pushing hard to keep moving, sometimes finding it hard to get through the stopped riders. I enjoyed the rest and warm, sweet wine. About 20mins along on a flat gravel terrain, my bottom bracket undid itself and locked the pedals from turning. Fortunately, I got out of toe straps without crashing. 20m up the road, a young Russian cyclist was trying to change his tubular tyre but for some reason had no glue - he was in a bind. Fortunately , I was carrying miracle yellow tape which he used and it was still holding 40km later at a food stop when I saw him. Didn’t even wear through! Asciano- 95km at 14:16 was a control and food stop. The warm, thick soup and olive oil soaked bread was a good source of fuel. The threatening rain was light and added to the difficulty on the dirt and was slippery in cleated cycling shoes and clogged the pedal slot. I noticed the black mountain bike/touring shoes were common- not authentic, but much easier & safer to walk the hills. Monte Sante Marie - 96km, 15:35 was a welcome stop after another gravel climb. I’d been riding with Kiwi Darren and his Dutch friends, which were good company. The last big food stop was at Castelnuovo Berardenga - 113km at 16:28. Last year, Kiwi Darren thought this was the finish and had celebration drinks and called his wife only to find he was still a very hard 30km to ride. The ride to Pianella was enjoyable over rolling hill with some fast, bitumen descents . I saw the worst of crashes on a very steep downhill gravel section. At this stage of the day there was continuous sirens of ambulances. It was often slower going down, just to be safe. The last 30km back up to the ascent of Castello Di Brolio and back to Gaiole was a bit of a blur. I finished at 18:15, 12 hours after starting, collected my medal and took my painful shoes off. Finishing these events is often a combination of relief and an anti-climax, until writing up the blog and reliving the day. There was a stream of 209km riders arriving to great applause as the darkness set in and I definitely respected them for their achievement. At 21:00, I had cycled back to Siena and was back in my room after 198km of cycling. After an enjoyable long shower and eventually clean hands, and a big glass of water it was sleep time for me - sleep trumped dinner! In summary, I was very happy with my first L’Eroica ride. It had consumed me for many months of bicycle restoration and training. My family have been ultra supportive. My 1950’s Australian made ‘Healing’ frame was unique at the event and I had many questions of its origin. My use of a Sturmey Archer 4 Speed FW internal hub was also unique- I received a lot of “Bravo Fixie” encouragement! It wasn’t perfect as the lowest gear meant more walking then expected. The main issue was the corrugated roads- I lost my chain at least 3 times, the circlip holding the rear sprocket came off once, the bottom bracket continually came lose. Maybe more locktite would have helped. Overall everything went well and to plan, I had no flats or serious crashes. The perfect L’Eroica bicycle? That’s my standby bicycle, a 1984 Vitus aluminum with compact crank for low gearing. It’s light, absorbs the bumps and easier and more recent to maintain. So if doing the 209km, I suggest getting an 80s light steel or aluminum (see regulations), add a compact low chainring set (many had tripled), the biggest tires possible for the wheels (>28mm) and train on mountain bike trails. Doing the 135km allows lots of time at food/check points, make friend and not forcing dangerous speed on downhill sections. You can rego for 209km and miss the cutoff if plans don’t work out. Repairs with miracle yellow tape. This Italian mechanic knew his trade- Note the hammer & screwdriver to fix my bicycle. My first task was bicycle maintenance. A few spokes in the rear wheel were loose - I’d read that at 200km re-tensioning was common. Before breakfast, I took a test ride to Piazza del Campo, where the crazy horse race has occurred twice yearly since 1633. On our Italy trip in 2008, I’d cycled here from San Gimignano in to meet the family in this square. This time I got equally as lost, on the narrow, step stone streets. The bike repairs appeared to have worked. After a big breakfast, I cycled 28km back to Siena. It has 3 big climbs (550m) and also some long downhills- a ride I’d do 6 times in my visit. Gaiole was very busy. I didn’t wait 3 hr at the bicycle mechanic and opted at more self repairs on the loosening bottom bracket. My one purchase was a cycling cap, which fits nicely under my helmet. Then I browsed the crowded markets again and resisted purchasing some tempting parts. On the return cycle, I noticed a lot more cyclist out. It was possible to hire a €1500 bicycle for €300 for the event, to be deducted for the price if purchased. At the top of the long climb to Castelnuovo Berardenga, I decided it was worth a photo stop and chatted in English/Italian/jestures to fellow cyclist on the same route. About half of these castles are renovated and the other boarded await TLC. Being Saturday night in a tourist rich town, I had trouble finding a table. The restaurant I chose ended up filling up and the sliced beef, salad & sliced Parmesan was an excellent choice. Naturally, with a long ride ahead I opted for pasta main. It was to be an early start and I went to bed with the excitement and anticipation of a ride that many describe as one of the toughest organized bicycle rides. Castelnuovo Berardenga- always good to reach this crest. I awoke after a great sleep to a beautiful Tuscan sunrise over the old city. Immediately, I went to work assembling my bicycle. Other then a little movement in the bag, it had travelled surprisingly well and went back together. The small pump dictated I would need a visit to the bicycle shop I had found nearby in the old city. The hotel breakfast was excellent - I opted for some Geoff Gardner Egg’s Legs and the search for the perfect Italian Hot Chocolate continues. At the bike shop, I was help to pump my tires to 7 Bar (what ever that is) and buy some patches and map. The Italian man was very helpful and helped me with directions to Gaiole. I then set this destination in the GPS, and headed down the steep, twisty road to the familiar road by the railway line. The ride to Gaiole was very hilly (500m climb over 28km) and I arrived to the setup of the markets, stalls and festivity for L’Eroica. Dinner was eaten inside the old city, about 10mins away. Pasta of course. The bicycle was in need of some maintenance with loose spokes an bottom bracket. An amazing selection of old bicycles to both purchase or hire. At last the trip to ride my restored 50’ Healing Bicycle in the famous L’Eroica bicycle festival in Italy. The Thai Airways Sydney-Bangkok sector on 747 -400 was comfortable for the 9.5hrs flight. After a short two hr transit in the enormous and modern airport, I caught an overnight 11.5hr flight on a new A390 to Milan. My plans were to catch up with Mark Weber who is holidaying in Italy and Spain. Immigration processing queue was long- we met later then planned at the large Milan Centrale Station. The Malpensa airport is about 55km out and has a quick train connection. The original plan was to cycle around Milan as tourists.I think walking was a better option as we headed via Galleria Victor Emmanuel 2 to the majestic Duomo Church. This area is crowded with tourisms. Along the way, we stopped for a coffee and pastry at a standup bar. Italian don’t make very good hot chocolates- it’s usually too thick and no milk. As Webes had not been to Milano before, I thought he must at least try to get a ticket for the Last Super by Da Vinci. To our surprise, it was sold out for 10 Days, so he got a look at the Church building and a photo outside. On our walk we went via a waypoint of the original Bianchi bicycle workshop. It has long moved to bigger facilities in Milano, though the building remains and the area is now cafes and restaurants. Time ran out with my train to leave at 15:20. I picked up my left luggage bicycle, stored for 5 hrs for €6, which seemed a bargain. In another attempt to get a hot chocolate, it was so thick and rich it was not finished. So continues the quest to find a good hot chocolate in Italy. I bid Webes farewell and will see him In late October. He heads to Spain to walk a section of the Carmino. The very fast train to Florence was extremely smooth and I marveled as AutoStrada travel seemed to be going 1/3 train speed. We arrived in Florence on time and I ran to make the train connection to Siena. The trip took as long to go 50km the long way round as the 260km just travelled. For a while I was concerned it was the wrong train as it went a big cycle to go around the hills, though eventually arrived in Siena in time. One observation is the lack of luggage space, especially for a boxed bicycle. After arriving at Siena Station, it was a steep walk of 1km to the hotel, only to find out later there are escalators starting in the shopping centre. It was now 36hrs since leaving Sydney. Dinner of pasta was enjoyed at a restaurant through the gates to the old city then welcome rest.